I'm all for spirituality and belief in a higher being but I don't like being preached to. It's common sense that if we eat better we'll feel better and most things in our lives will also be better. Even more so if you have a "shoulder to lean on" in the form of whomever it is you believe is your higher being. In the introduction to this book, which is lengthy, Ms. Meyer says on page viii, '"He [the Holy Spirit] asked me if I thought my attitude was helping me do His work". He then said, "I want you to get over this [her guilt] because you are no good to Me in this condition".' Give me a break! If we all could "hear" the Holy Spirit, there'd be no wars and fighting - it's simply not that cut and dried. Joyce Meyer's intentions with this book, I feel, are basically to steer those of us who need a little direction in life, to clean up our act, eat healthily, exercise, and take care of ourselves. But, when I read, "He'll [the devil] put lots of bad food within easy reach and let you mistake spiritual or emotional hunger for physical hunger", I nearly barfed. Please. Temptation is all around us in many, many forms, and was put there by us, humans, people with the gift of choice. We have to work on strengthening our willpower and stop blaming "the devil". Of course, many have psychological issues which need to be dealt with so they can move on in a positive way. It's great if you have a spiritual relationship with your God, someone to whom you can vent your frustrations and desires, and believing there is someone out there for you, is often all you need. The first bit of sense, if you like, came on page xxi: "When my blood pressure hit a dangerous peak, I knew it was time to make some changes and the only one who could do it was me". We are responsible for the upkeep of our own bodies. We know right from wrong and good from bad and again, we have choice, the greatest tool we have. All this is my opinion and stems from just the introduction in this book. Ms. Meyer talks about her own life's up and downs, how she got through it, her ministry, weight and weightloss, exercise, and more. All things we do ourselves and for ourselves. 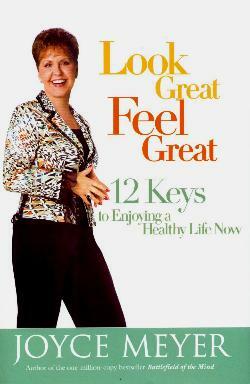 12 keys is what Ms. Meyer presents for us to live a better life. Her chapters on Metabolism (Key 3), Exercise (Key 4), Balanced Eating (Key 5), and on how to motivate teens in her Epilogue, are well-written and easy to understand and grasp - not too technical and very, very interesting, and this is the backbone of her book. I believe in the Grace of God, in prayer, in second chances, repentence, and honesty - I don't go for insistence that the Bible is the bee and end all - it's open to massive and conflicting interpretation. I think the Ten Commandments are a good way to live your life and to be happy. Quotes from the the Bible are sprinkled throughout the book. Conclusion - The idea of this book is good but I didn't enjoy the frequency of the Biblical quotes and found myself getting annoyed at times.